Hello again-this time from Scottsdale! Several people have asked us for a wrap up post so thought we would put one more on here. After surviving the world's longest continuous, nonstop flight (fact from our flight attendants) from Jo'burg, South Africa to Atlanta, Ga. we are back in the good old USA! Again, some of us were able to sleep more than others on the return but we are all thankful for a safe and uneventful flight home. Our words simply cannot express how grateful our hearts are for all the many ways your prayers lifted us up and sustained us while we were there. We are all so blessed to have gone and witnessed such a God-ordained time of experiencing where God is at work in the world in such a vibrant manner. We hope that we can convey our passion and excitement to our church body so that you will, as always, know that you are a vital member of our traveling team. Thank you for loving us and committing your time to this great calling of sharing the most wonderful news in the world-the Good News of Christ! Our Southern Baptists missionaries Cliff and Bev Vick as they are in Arizona for a few weeks attending his mom's funeral and having family time. Julius and Cintia Mbu as they continue praying for God's will to be revealed in their lives regarding their ministry. Our church body to receive with enthusiastic, tender hearts all the team has to share from their experiences in South Africa. The team to be able to share clearly what they sensed God showing them every step of the way of this trip. Rest and recovery for the team, the churches they ministered with, the Vicks and Mbus. The people of Pretoria to remain open to hearing the Truth. Here are some photos of our last day(Monday) in Pretoria, South Africa. 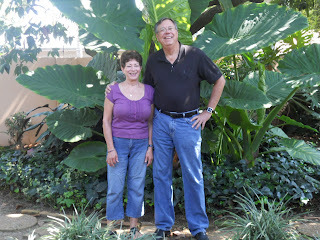 Beverly and Cliff Vick IMB Missionaries in South Africa. 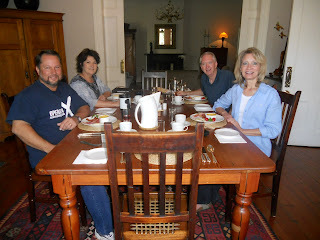 The team's last breakfast before leaving Pretoria. Sunday Worship and Wrapping Up! We've thought about all of our friends and family worshiping in church today and we are praying you are having a wonderful Lord's Day. Our last day of this mission trip has been just as exciting as every other day that we have been here. Our first service was out in Gerhardsville in a field next to the supermarket. We had about 35 in attendance after Pastor Cliff made a few trips in the van to pick up some people-otherwise, everyone walked to get there. Many young moms with babies and young men were there. Again, the praise and worship was very lively and we knew some of the songs. Dave, Keith and Wanda got to teach Pastor Albert a new song (Blessed Be Your Name) and then sang it with him during the service. Julius preached on the passage where Jesus heals Peter's mother-in-law. His message was about the Presence, Power, and Purpose of God in your life. After the message, 12 people prayed to receive Christ! We really stand in awe of what God is doing in South Africa-through the wonderful servants He has in place here. After Bev's delicious lunch of chicken picatta it was back to Laudium for their 3PM service. We probably had 40-50 in attendance for this service. Again, the joyful songs (some in languages we cannot understand) brought our hearts to such a tender place to receive the message Pastor Julius brought. Several women came forward to make decisions and Bev, Cyntia, Mona and Wanda each got to pray with some of these women. What a time of refreshing, learning and growing for all of us! We were talking today about something we hadn't blogged with you about yet and that is the driving issues here. First of all, you drive on the left in this country. The person you don't want to be in a 10 passenger van is the front seat passenger-it looks like the headlights are coming straight at you! So, Keith decides he needs to try driving on Friday coming home from the wild life preserve. Of course, about that time it's starting to get dusk and it starts raining. We were pretty nervous but he actually did good for a rookie according to Cliff. It was kind of scary when he nearly flew through a toll booth w/o stopping and when he cut it kind of close when he passed on the right on a 2-lane road! But God covered us with protection and we're all fine. Dave's thinking he wants to try it tomorrow before we leave-guess it's a guy thing. Another issue are the round-abouts and the speed bumps-the worst place to be in a 10 passenger van is the back seat especially when you're tired or haven't had a "pit stop" in a while! I know we have a few of them in Phoenix, but here they are everywhere! Oh yeah, the traffic lights are called robots-isn't that interesting?! Our worship site in Gerhardsville. Dave and Pastor Albert rehearsing a song for the service. Mercy holding a friend's baby. Wanda, Mona and some of the worshipers today. Dave, Keith, Pastor Gideon and Pastor Joe. Our team spent another amazing day being a part of God's work here in South Africa. Today we spent the morning back at Victory Baptist (you know, where our van window was smashed), this time doing evangelism training. We didn't know it before today but the night before the members had been at the church for their all night prayer vigil which they have once a month. Many of them went home at 6am and came back to the church at 9am for our training! We had 10 participate in the training. Julius trained them using the evangicube, Dave used the ABC's to salvation and Keith presented the Roman Road plan. The 3 of them all did outstanding jobs on their presentations. And the people seem so excited to get out into their community to try it out-such boldness! While all of that was going on, Wanda and Mona showed the 24 children (ages 1-16) the way to share the gospel using the Gospel Silly Bands. They also sang and played games with them. Their version of musical chairs got a little rowdy and one chair was broken so we didn't get to finish that game-but all in all a very successful morning teaching how to share The Good News! After a tasty lunch fixed by Cyntia and Bev we headed back to Laudium for the open air service at 3PM. While the pastors and musicians were setting up, the others from our team walked around the village market handing out Christian literature and inviting people to our service. What an awesome event to be a part of! After much joyful singing and praising the Lord, Pastor Julius presented the Gospel of Christ in such a powerful way that we were all touched. Eleven precious souls came to know the Lord as their savior! We just keep saying "Wow" over and over. Do you remember the prayer request for protection for the Hindu lady because she was getting threats from the Muslim shopkeepers for providing us electric power? Well, today one of the Muslim shopkeepers offered to let us use their power for our sound system! See how mighty your prayers are?! And also how Powerful our God is?! For tomorrow we will be heading back to Gerhardsville for an open air service there in the morning and then to Victory for their 3PM service. Please keep those services in your prayers that many we have invited will attend and that they will hear God's Word through Julius and respond. Pray for strength for Julius' voice- he had to talk quite loudly today even with a mic. That the 11 who received Christ will attend one of the services tomorrow and that someone from the churches will contact them this week and start disciplining them. That the young lady named Shoomay who became a believer will have relief and healing from stomach pain. Here are some photos from today's wonderful events. Thanks for your comments to us-we love reading them in the morning before we head out for the day! You cannot know all the ways you have encouraged us to stay strong in the Lord-thank you again. The children from Victory Baptist church in Laudium and their friends. After an hour and forty five minutes, Mona and Wanda were out of ideas-Keith came to the rescue! Hope you can see ok-these were some of the worshippers today in Laudium-they were dancing & singing! More Laudium worshippers-of course we weren't dancing- we're worshipping!!! Julius preaching at the town market in Laudium. So good to have Internet tonight-we really missed not being able to tell you about our day yesterday. Thursday was another beautiful, sunny day around 85. Julius, Wanda and Mona walked to an orphanage and to a creche(daycare). The boys from the orphanage were all at school but we had a good visit with the staff there. The creche was a delight to us all. There we met Daisy, her mom and 2 sisters who run the creche. The children were adorable of course and there Daisy had taught them songs about Jesus which they were delighted to share with us! Mona demonstrated the Gospel silly bands with the children and then we just played with them. We tried to play Duck, Duck, Goose with them but they didn't get the concept that there is only One goose so they all tackled Wanda(see photo!). Dave, Keith and Cliff again prayerwalked in the city and met and shared with many different folks in the city. That afternoon we all met up with some of the members of Victory Baptist and prayerwalked in Gerhardsville. If you can imagine picking up and dropping a house from Paradise Valley into a countryside setting that is exactly what we saw! What a contrast-but again many people seemed excited to come to the open air service there at the Gerhardsville Market on Sunday morning. Today (Friday) was a wonderful day of relaxation after a thrilling, busy and exhausting week of evangelizing and praying in Pretoria. We visited Pilanisburg Game Park with Cliff, Bev, Julius and Cyntia. Bev packed us a breakfast of muffins, coffee and juice(we left at 6AM!) and then a wonderful lunch. Today started off rainy and cool, which we loved because the animals seemed to be moving about a little more. Only 5 minutes or so after entering the park we saw two white rhino only about 100 ft from our van! We also saw an elephant, hippos, giraffes, zebra (pronounced like Deborah), wilde beast, springbok, and many others. The day did clear up for our picnic and we got some good photos in the park.A truly amazing God created so many wonderful things for us to see and enjoy! Our time of evangelism training at Victory Baptist Church Sat. morning will be easily received by these faithful church members. That Mona, Wanda and Dave will have enough to keep the kids that come busy. The open air service held in Laudium town square Sat @ 3pm. Protection for the Hindu lady shopkeeper supplying our electricity. She has been threatened by some of the Muslims in the area for providing it for us. That people will hear the Truth and souls will come to Christ. Julius is preaching-pray for him as well. Our service in Gerhardsville(where we prayerwalked Thurs. afternoon). It is open air at 9AM. Then the 3PM worship service at Victory Baptist Church.Julius will be preaching both of those as well. Alright, let's try to get you a few more photos-here goes! Our love and prayers are with you as you pray for us. Team at the Union Buildings grounds with Pretoria in background-Wednesday morning. We had a wonderful day of prayerwalking back in Sunnyside and City Center, but today was a little different in that we walked through many of the parks they have here. How amazing to see the openess and the willingness to listen that we are seeing here. We've talked with moms with young children, many,many college students, and then unemployed men just hanging out. How thrilling today to see 4 men pray to receive Christ in one of the parks! Julius was able to get their names and can hopefully make follow up contacts with them. We had so much good individual prayer time with people today-God is just so good! After school let out we saw grade school children just too precious to believe. The little girls could not stop hugging Wanda and Mona-their faces just lit up when we said we were from America! So different from yesterday when a muslim man's face filled with hatred when Dave said he was from the U.S. The little boys could not get enough of Dave and his teaching them some simple knots with a rope. We are definitly hearing God saying that the young people of this country need to be reached.Tomorrow we will walk in the city again and then have some debriefing meetings about what we have been seeing and hearing. Okay, so for our light note tonight-have we told you about the haw-di-daw? The best way to describe the sound this bird makes is something between a crow and a goose. Then, multiply that with about 10-12( however many come in a flock) making this horrible racket between, oh say, 4 to 5 am! Yeah, the first morning we thought we woke up in Jurassic Park-it is an unbelievable screech! Dave just wishes he had his gun-we would be eating fried haw-di-daw tonight! We woke up this morning feeling very refreshed after what we all agreed was our best night's sleep yet. But of course after walking 8 miles yesterday in Sunnyside what would you expect! Anyway our day started out with meeting some of the folks from Victory Baptist Church in Laudium. Their building is a very nice, fairly good size brick facility but it is in a terrible crime area as we were soon to learn. We met pastors Albert and Gideon as well as Gideon's wife Mercy and another faithful member named Memory. After splitting up into groups we walked the hills of Laudium and into the downtown area. This area is heavily influenced by Hindus and Muslims. The temples and mosques are very prevalent and we spent time praying in front of those for God's Truth to shine through these faithful Christian churches into this community. Mercy was so bold in her witness and you can tell how respected these Christian pastors are here. Not long after our walk began a would be thief broke into our rented van which was parked right beside the church. He broke the passenger's side front window, which here is on the left, and had the upper part of his body in our van when neighbors in the area saw him and gave chase. They didn't catch the guy but they did chase him off before he stole anything out of our van. Well, now we see how important all you prayer warriors are. Thank you, thank you thank you! Mona and Wanda had left passports, money , debit cards, a camera and ipad in that van (not very smart, we know) and we truly believe the Lord protected us through your prayers. So now we have a white van that cries "tourist" instead of the navy blue, and that story is another miracle in itself that we can share with you when we get home! The Vick family, Clifford's mother died this morning. He'll be returning to the states March 2. A man who needs a bed and a suit, he is getting married in two weeks. Pastor Mbi and his church in Sunnyside who desperately want God to work through their church. A man in Laudium who is very ill and can barely walk. A Christian school in Laudium. There are only Hindu and Muslim schools for children to attend. The youth of Laudium where drug use and activity is overwhelmingly high. Protection from the Muslim community and for the children who are influenced by its teaching. We will attend an open air service soon and the Muslim leaders want the power turned off, pray protection for the woman who manages the electricity as she provides it for us. For continued listening for God's plan for our church. These are just a few, there is much more to pray for. Thank you for lifting each of us up in prayer daily and hourly. We feel them! Everyone is doing well. Dave playing with the band Sunday at Laudium Baptist Church. We knew most of their songs-it was really cool. This is a pic of Sunnsyside where we prayerwalked on Monday. We will be back there tomorrow-praying in the parks. Pray with us that the hearts of the people will see Jesus in us and respond. This is Pastor Gideon, Dave, Pastor Albert, Keith, Pastor Vick, Pastor Julius and Memory. This was taken at Victory Baptist Church after our walk in Laudium. We would like to send more pics but they take a LONG time to upload-anyone have a tip on how to make that go faster-Kevin? Today we prayer walked in Sunnyside and City Center.It's just amazing to see the crush of humanity that probably do not know the Lord. The average age we saw today we guessed to be about 25. It was amazing walking with Julius-he seems to know everyone in the city-from shopkeepers to other ministry leaders. We prayed with a man getting married in two weeks who needs a bed and a suit. Also prayed over a struggling church. We are certainly getting a better picture of the city and the needs there. We had a wonderful day here worshipping at Laudium Baptist Church. Their music and service was joyful and worshipful. Some of the believers shared testimonies. One lady, Cookie, shared how God had impressed upon her ladies prayer group to fast and pray every Wed. from 6a-6p. Then God led them to walk and pray around the Laudium secondary school 7 times. Teachers there saw a marked improvement in the childrens' behavior, they got a wonderful new principal and even the grass and yards appeared better cared for. What a witness to us! Dave played guitar along with the drummer, guitarist, and trombonist in the band and they all sounded great. Mona, Keith and Wanda sang and worshipped joyfully with all of them!Right after service we broke up into groups of 3-4 and prayer walked around their church. Though, small in number you can see this church making an impact in this largely Indian community. After church we ate a lovely traditional Indian meal of Brynie (bre-ah-nee) which is rice, chicken, potatoes seasoned with cardamom, cinnamon, star of anise, coriander and fennel seed. It was delicious. They Reddys prepared the meal for us- Kamela and Cookie (mother and daughter). 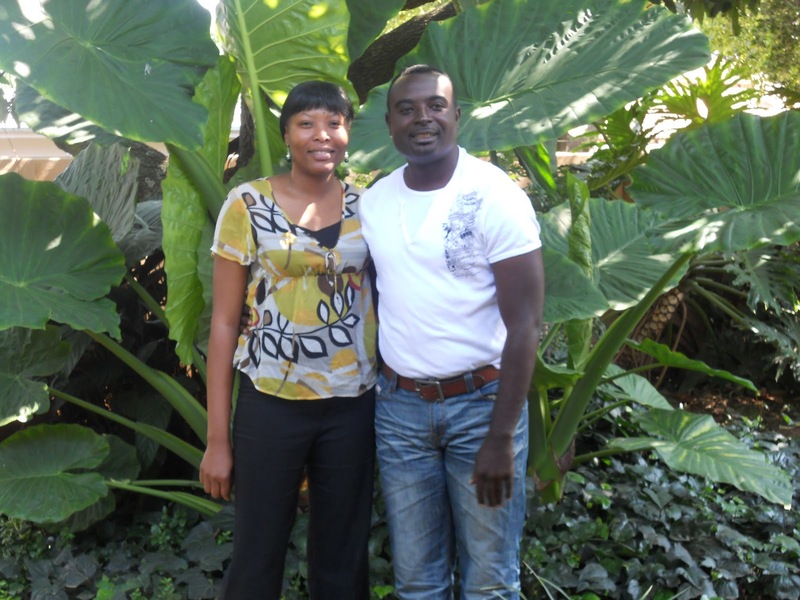 Tonight we met a potential pastor for the Pretoria area, Julius Mbu and his wife Cyntia. 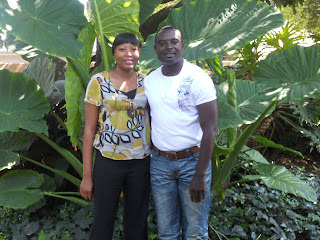 They are a wonderful couple from Cameroon and truly have hearts for the Lord. Tomorrow we will start prayerwalking around 9am in Sunnyside which Julius says has a wide variety of ethnic groups.Julius and Cliff will be going with us-so there are 6 of us. We are praying for protection and our hearts to be open for God to show us who we should talk to and that we will listen to Him. Thank you again for your prayers for us and for the ministries here with the Vicks. Please continue praying for Cliff's mom-we know God's timing is perfect!